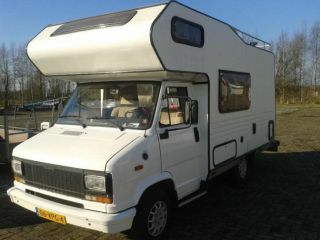 Beautiful and well maintained Peugeot camper for the whole family. Never convert beds, everyone has their own permanent sleeping space. There are 4 fixed sleeping places, but the seating area can be transformed into a large bed. Then there can be 5-6 people sleeping. 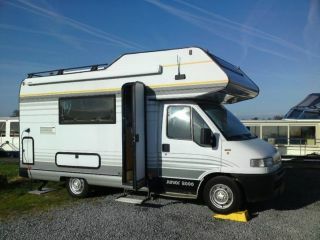 The camper is very spacious and suitable for long people, the pitch height is 2.20 meters. In the xxl garage there is space for bicycles, camping equipment and even a surfboard can be found. The camper has just been completely refurbished and painted in fresh retro colors, really everything is new. The 2.5 liter turbo diesel engine with power steering really brings you anywhere. While driving, you can enjoy the 2 swivel leather seats while watching the TV and DVD in the back. There is a CD player with usb at the campsite, so you can bring your favorite holiday music. A 6inch Tomtom with maps for all of Europe brings you to the most beautiful places. Outside, everything is complete with a canopy with safari, chairs, table, dishwasher and even a terrace for the cold evenings. The barbecue works on gas, directly from the fixed gas tank. Outside, everything is complete with a canopy with safari, chairs, table, dishwasher and even a terrace for the cold evenings. The camper has an inverter for 230volt, even while driving. Possibly a 2000w generator is also available for the free campers. The camper is as complete as possible, including clean sheets, pillows, spare covers and 2 single duvets and 1 double duvet. Also in the kitchen everything has been thought of. There is coffee, tea, salt and pepper, dishwashing and tea towels. That's another problem! Let yourself be surprised by this fresh and cool camper, which is also beneficial to rent. Available in the booking process, from NZ$14.80 per day you can reduce your deposit and deductible to NZ$150. Keep it tidy, but enjoy it. It is vacation ! Ample car "Wilfred" "Last minute stay"